Wagner took a break from the Ring after Act 2 of Siegfried to write "easier to perform" music dramas. His infatuation with Mathilde Wesendonck, poet and author, is said to have fueled this tragic love story. So much has been written about this work I won't even attempt to state it all here. Let us just say it was revolutionary. Beautiful, spiritual, lewd, spellbinding are just a few descriptions I've read. It greatly influenced all music after it. I frequently shed a tear when the last notes fade away. So what's your pick for this mesmerizing masterpiece? Last edited by Itullian; Oct-19-2017 at 04:50. Last edited by DarkAngel; Oct-19-2017 at 05:18. Last edited by Pugg; Oct-19-2017 at 12:05. Bernstein recording for me also. Ecstatic. Because of the gorgeousness of the score I don't mind a conductor indulging a little in pure sensuality when it comes to this opera, but for my taste Bernstein practically wallows in it and doesn't keep the pace where it needs to be to keep the dramatic temperature turned up like my favorite versions do. Unfortunately his pair of lovers are also one of my least favorite in record. The Furtwangler is still the most effective and all-encompassing to my mind. Last edited by OperaChic; Oct-19-2017 at 11:55. Agree with every sentence here. I love listening to bits and pieces of the Bernstein but it doesn't hang together as a whole. It's not a unique opinion but for me, Furtwangler and Bohm are unmatched here, especially Furtwangler in Act 2 and Bohm in the outer acts. No one comes close to Furtwangler for me. His conducting seems to make time stand still. Wish he'd have recorded Parsifal. I also enjoy these 2. The Kleiber is a more lyrical approach but done beautifully. The Bohm very well recorded and dramatic. And they both have all 3 acts on their own discs which I LOVE. Last edited by Itullian; Oct-19-2017 at 15:38. Because of the gorgeousness of the score I don't mind a conductor indulging a little in pure sensuality when it comes to this opera, but for my taste Bernstein practically wallows in it and doesn't keep the pace where it needs to be to keep the dramatic temperature turned up like my favorite versions do. Unfortunately his pair of lovers are also one of my least favorite in record. And Bernstein seems bent on pretending that they're not there at all....perhaps just as well. I really have trouble with this opera. Where the Ring operas suite me just fine in length, this one feels too long. I won't say I dislike it, and sometimes I can say I enjoy it but it always feels like such an effort is expended. Nevertheless I have multiple versions, in search of a satisfying one. 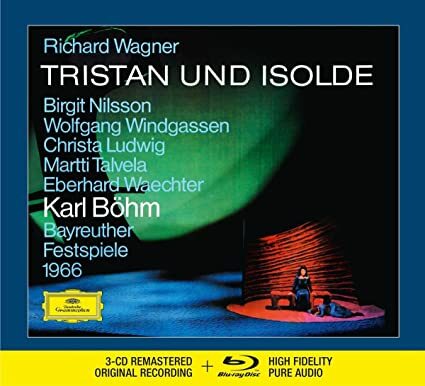 Barenboim has my favorite first act and Isolde (Waultraude Meier) and Bohm I think my favorite overall. 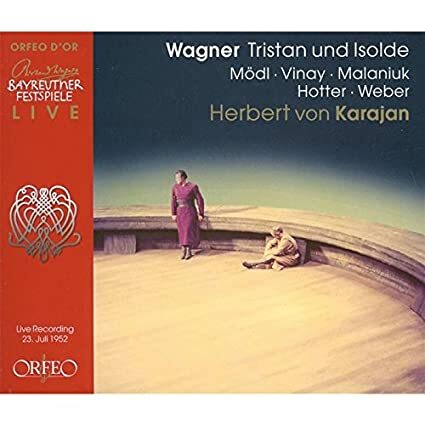 Von Karajan with Moedl and Vinay and Barenboim for me. 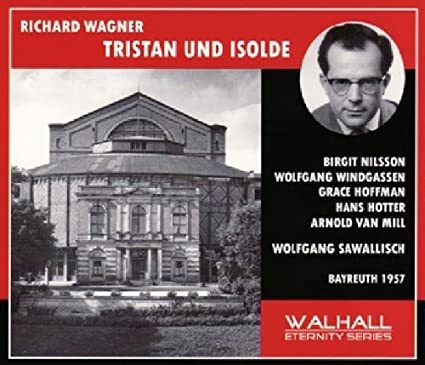 Those are at the top of my Tristan list, too, supplemented by the various Bayreuth recordings with Boehm, Nilsson, and Windgassen, the late 90's Met broadcast with Heppner, and Karajan's stereo recording, for the presence of Vickers. Try assimilating 1 act at a time. Listen for the interaction of what's being sung and the orchestra. Listen for the various themes as they weave throughout. Don't worry about it, it will come. Last edited by DarkAngel; Oct-19-2017 at 21:52. 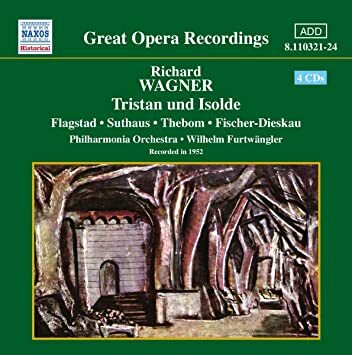 Fine recordings, but only Furtwangler fully inhabits Wagner's "Wunderreich der Nacht." The Romantic dream he and Flagstad make of the second act is unapproached by others. But I do wish that we had a recording under Victor de Sabata, a truly great opera conductor who gave us the best of all Toscas. 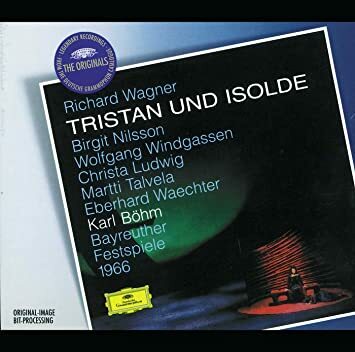 Snippets from a 1930 Tristan at La Scala with an excellent Italian cast (singing in Italian, of course) are searingly intense and heartbreaking, infusing the music with a frank emotionality that seems almost a thing of the past. P.S. The Naxos cover art is criminal. Last edited by Woodduck; Oct-19-2017 at 22:13. 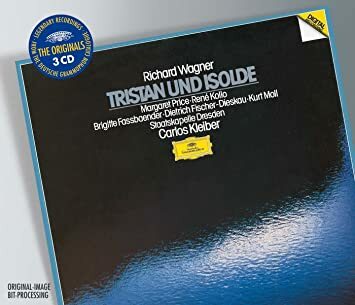 The (Carlos) Kleiber studio recording was my first ever Tristan, and Margaret Price's "Mild und Leise" is still my go-to by a country mile. Have also added the Karajan (Vickers), Furtwängler (52), and Böhm (Bayreuth) ... so it seems I've come to the conclusion arrived at by most others. I've never been particularly interested in adding anything new to this list.